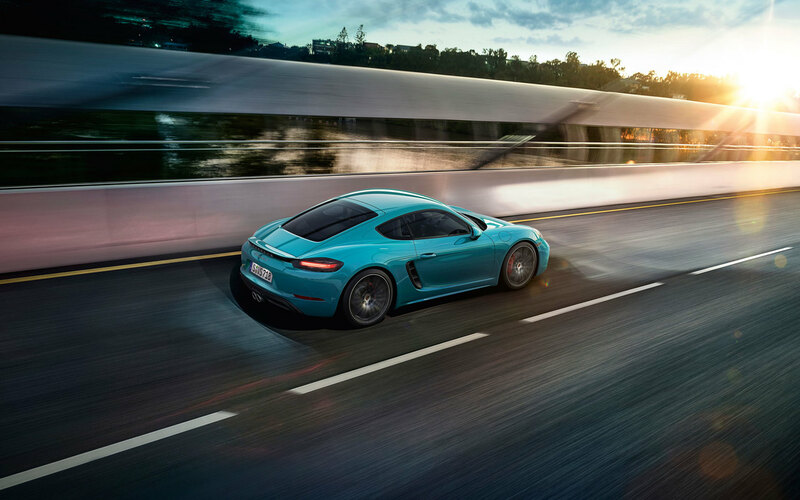 It’s no wonder that the 718 Cayman doesn’t simply carry on from where the 718 GTR Coupé left off in 1963, but seeks instead to piece together a legend of its own. With its own mind. 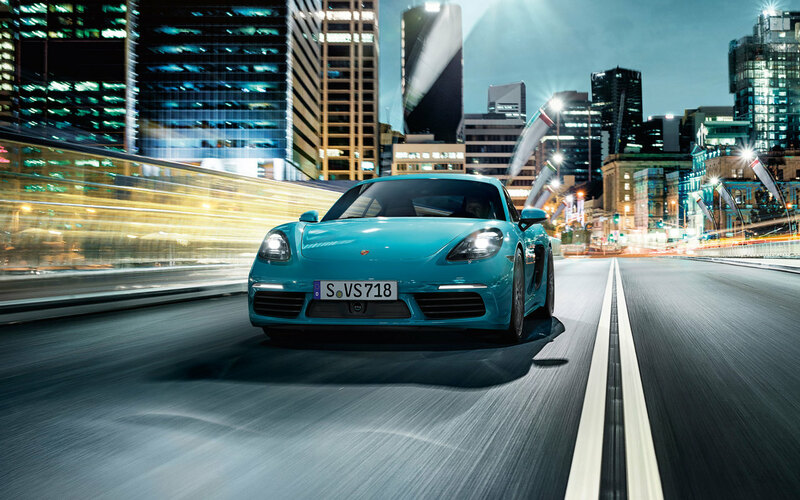 With sporty fighting spirit and with every twist and turn. Could have, should have, would have. Life’s too short for ‘what ifs’. Too short for unfulfilled daydreams. 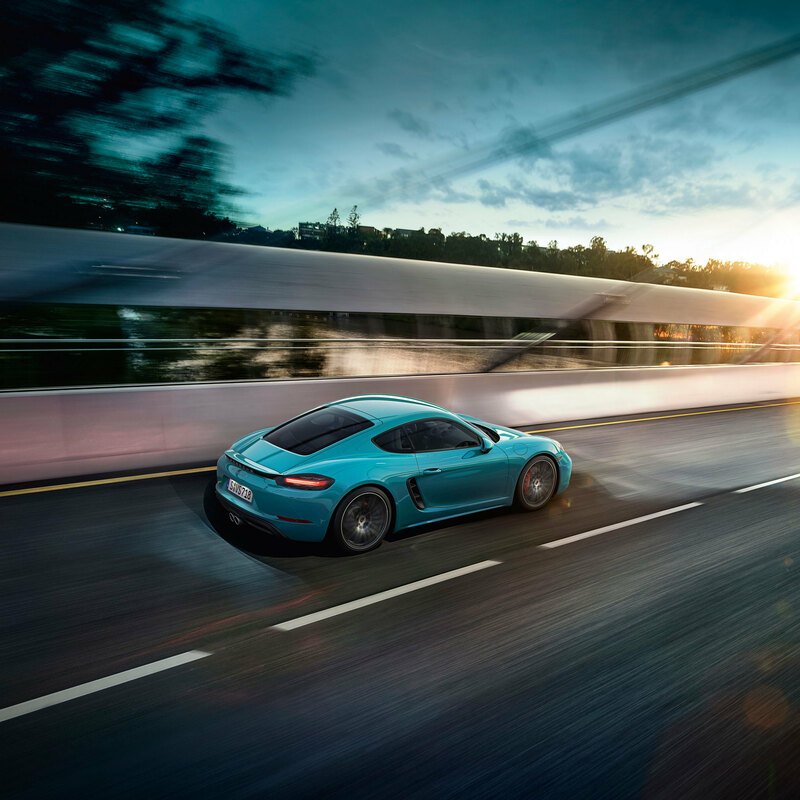 The 718 Cayman makes a clear statement: let’s go! Precise, not fanciful. Self-assured, not restrained. Low, wide and sleek. 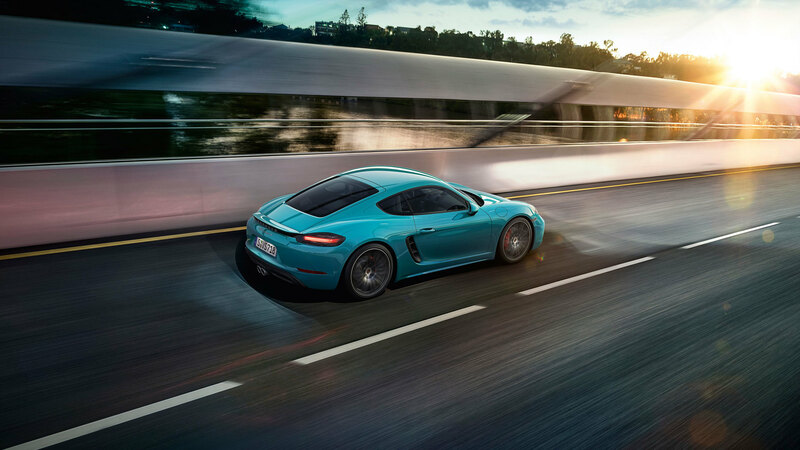 The exterior design of the 718 is distinguished by sporty edges and clearly defined formal contours. When closed, the fabric hood of the 718 Boxster completes the sleek silhouette typical of a sports car. At the push of a button, it opens and closes fully automatically in 9 seconds – even on the move, up to a speed of 31 mph. 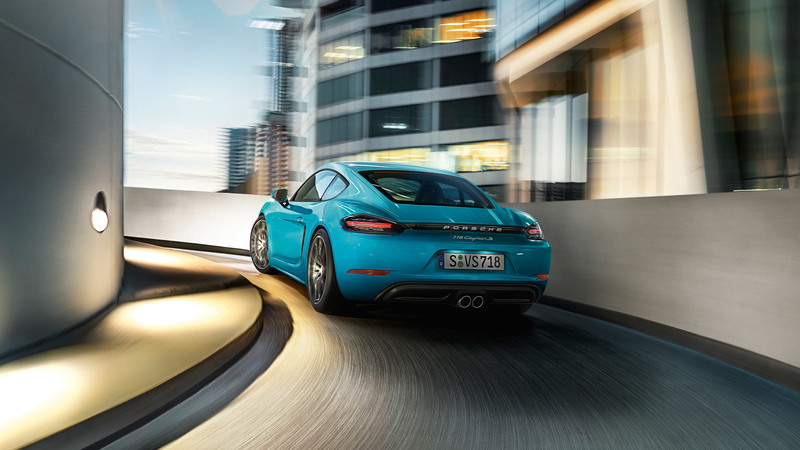 The rear of the 718 is an expression of superlative sporty performance – and of the superlative performance of our designers. It is more cleanly defined, more pared back. The wing above extends automatically at a speed of 77 mph, reducing lift to provide even better roadholding performance. The base models are equipped with a 2.0-litre turbocharged and horizontally opposed engine with direct fuel injection (DFI), VarioCam Plus and integrated drysump lubrication. The unit develops 220 kW (300 hp) at 6,500 rpm. Maximum torque is 380 Nm. Thanks to turbocharged induction, it is available as low as 1,950 rpm and prevails until 4,500 rpm. 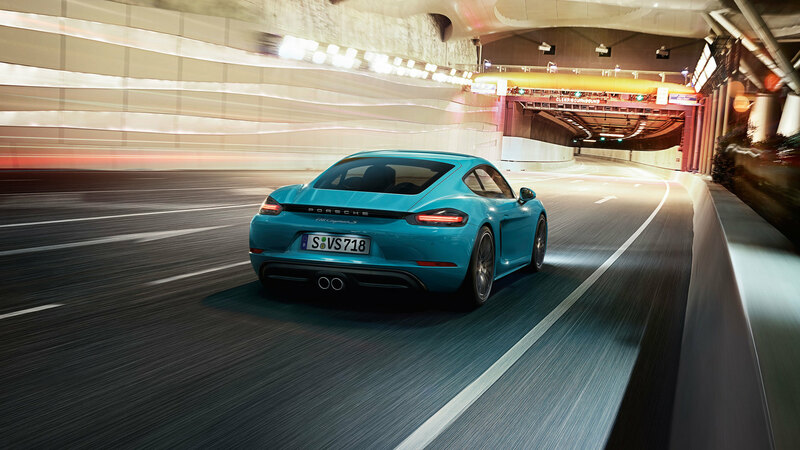 With Porsche Doppelkupplung (PDK), the 718 Boxster and 718 Cayman accelerate from 0 to 62 mph in a mere 4.9 seconds, reaching a top speed of 170 mph. 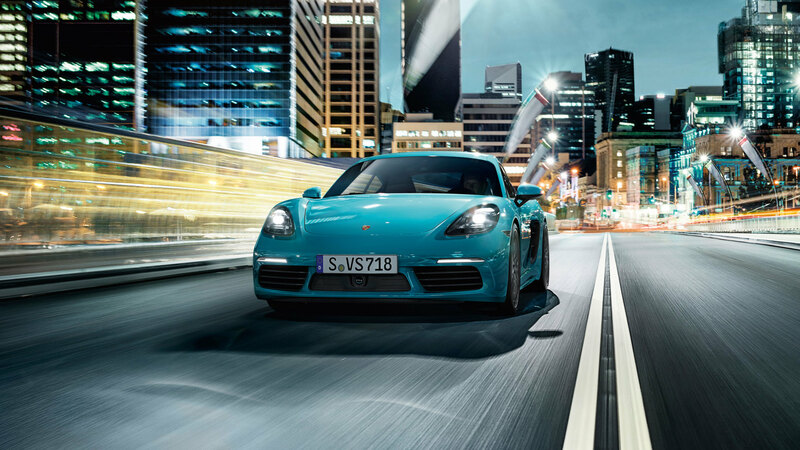 The S models draw their power from a capacity of 2.5 litres. The result is 257 kW (350 hp) at 6,500 rpm. The maximum torque of 420 Nm is available across an impressively wide range from 1,950 to 4,500 rpm. 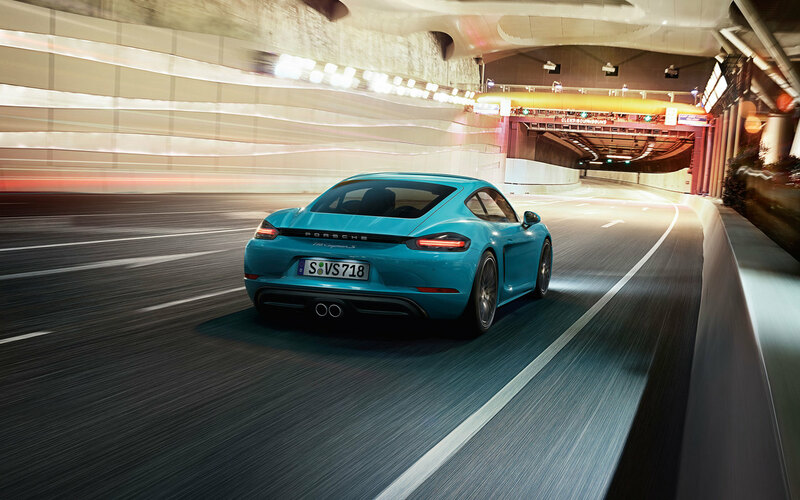 This engine – like the unit in the 911 Turbo – also comes equipped with variable turbine geometry (VTG). VTG provides an even more consistent delivery of power and, in turn, greater driving pleasure. Propulsive potential? Top speed is 177 mph. 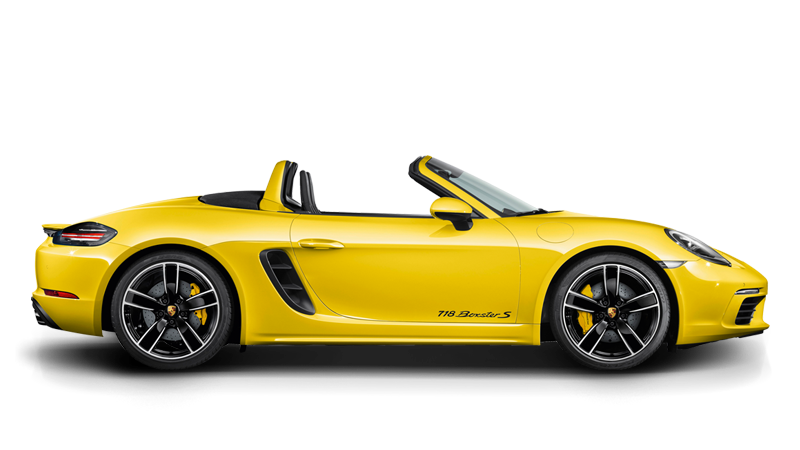 With PDK and Launch Control, the S models sprint from 0 to 62 mph in just 4.2 seconds. The 6-speed manual transmission offers short shift times for a sporty and directly engaging driving experience. 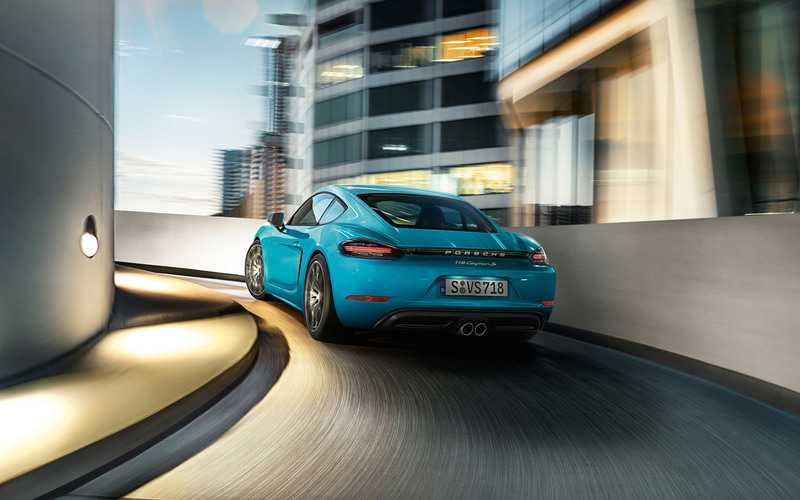 The drive becomes even more of a snap in conjunction with the optional Sport Chrono Package: in SPORT and SPORT PLUS mode, the dynamic throttle-blip function ensures the optimum engine speed for every downshift, a more emotional driving experience and an impressive sound. 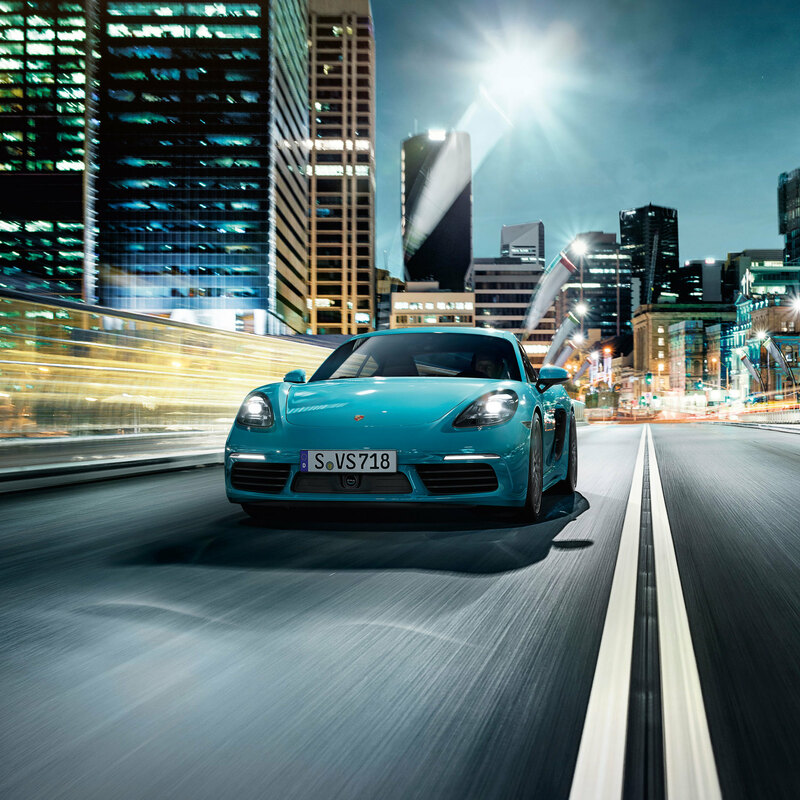 The Porsche Dynamic Light System (PDLS), which includes expressive four-point daytime running lights, headlight cleaning system and dynamic range control, is available as an option. The dynamic cornering light function swivels the main headlights towards the inside of a bend, based on steering angle and road speed, so as to light up more of the road at tight bends and turns. Put simply, the road ahead is illuminated the moment you start to corner. Superior safety meets sporty design in the form of optional LED main headlights including PDLS Plus. In addition to being efficient and long-lasting, LED technology also creates a light very similar to daylight and thus helps to reduce driver fatigue. Optimum visibility is assured by integrated four-point daytime running lights, the headlight cleaning system and dynamic range control. 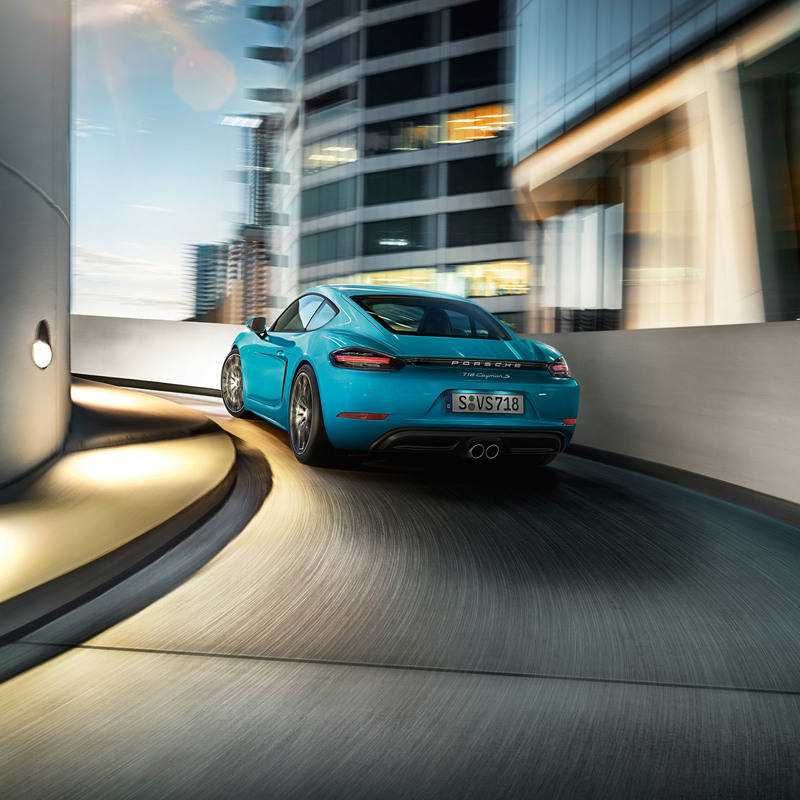 Porsche Communication Management (PCM) with 7-inch touchscreen display and optional navigation module enhances form and function with a further component: near-boundless possibilities. The Connect Plus module is the driver’s gateway to the digital world. In the interior, too, clever storage solutions offer plenty of space. The compartment under the armrest which includes the reception-optimising smartphone compartment as part of the Connect Plus module becomes the ideal interface between your smartphone and your 718 model. Further convenience is provided, for example, in the form of two compartments in the doors, clothes hooks on the seat backrests and two practical cupholders above the glove compartment. Optional Lane Change Assist uses radar sensors to monitor the areas to the rear of the vehicle and the blind spots on either side. Above a speed of 9 mph, the system issues a visual warning signal in the window triangle trim whenever a vehicle rapidly approaches your vehicle from behind or enters one of your blind spots. In this way, Lane Change Assist improves comfort and safety, particularly on motorways. However, the system does not actively intervene to control the vehicle and can be deactivated at any time. Featuring four inconspicuous sensors at the rear, optional ParkAssist audibly alerts the driver to the presence of obstacles detected behind the vehicle. An intermittent warning tone increases in rapidity as the obstacle is approached. 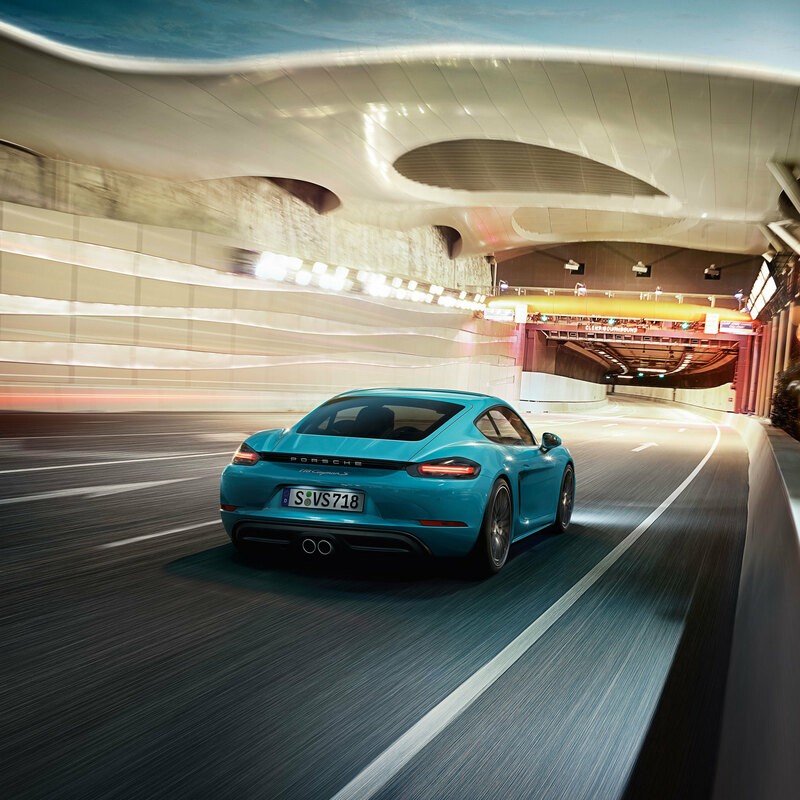 The enhanced Porsche Communication Management (PCM) with navigation module is your central unit for all infotainment applications and is standard equipment in all models. The PCM features a high-resolution touch display with integrated proximity sensor which allows simple and convenient operation. Infotainment starts when you charge and connect your iPhone® or any other audio source. You can connect your device easily using either the USB port or AUX input. An internal hard drive („Jukebox“) and two SD card readers are provided in addition to the CD/DVD drive for playback of your personal music. After inserting the SD cards, you can simply play your music with the music player in the PCM. With the Connect Plus module as standard, you have access to a range of Infotainment and Navigation Services, for example real-time traffic information. Thanks to this visual aid, you can be sure that you’re on the fastest route to your destination even before you set off. Throughout the journey, the real-time traffic information is regularly updated – keeping you on the recalculated optimum route.